Ontario's suspension of procurement programs for more renewable energy is big news. I'll cite various views on it here, but also editorialize after quoting from the government's press release - with some emphasis added. Before listing mainstream media articles of interest covering the announcement, I'll emphasize this "Cold Air Currents" blog was created to post articles I found interesting - while my "Cold Air" blog was entirely my original work. On this topic, I am an expert, so I'll be both editorialize more than usual, and probably be a little scattered as this announcement touches on many broad themes that deserve (and mostly have) independent articles. I wrote the last procurement would add $100 million to Ontario ratepayers bills each year, for 20 years - which makes the government's new $3.8 billion savings claim seem reasonable. I was more generous than the government's new press release in attributing minor carbon reductions, with an implied cost of $446/tCO2e. Following is a summary of press coverage - ordering the sources from most reputable on the topic, to least. The decision to stop buying more wind and solar is also an abrupt about-face for a government that had turned doable renewables into a religious mission. The planned new capacity — including 600 MW of wind and 250 MW of solar—had only been ordered by ministerial directive last April. Known as Large Renewable Procurement II, the new plan follows LRP I, which set out earlier to contract 300 MW of wind and 145 MW of solar. Those projects have not yet started. The surplus electricity capacity means that nuclear, gas, hydro, wind and solar power producers are often paid not to produce electricity. At other times, surplus power is exported at cheap prices to neighbouring states. ...losses are mounting as more and more surplus wind and solar energy is added to the system. Of all the spending scandals Ontario’s Liberal government has been involved in since 2003, none has been bigger than its mad pursuit of expensive, unreliable and unneeded wind, solar and biofuel energy. No other scandal — eHealth and Ornge pale by comparison — has cost present and future generations of Ontarians more money. Tuesday’s announcement that Premier Kathleen Wynne is cancelling all future large-scale wind, solar, biomass (and, irrelevantly, hydro) projects — about 1,000 MW of excess capacity given the province’s huge energy surplus — is too little, too late. Global News' latest reporting included words from Keith Brooks at the disreputable Environmental Defence, and Eli Angen of the drink thank Pembina Institute - an original member of the Green Energy Act coalition and producer of junk studies used to justify its continuation. One lesson others should take from Ontario's surging rates is that a legal status and letterhead doesn't make anybody an expert in anything except acquiring legal status, and letterhead. Mr. Smitherman, the father of Ontario's juvenile Green Energy Act, and related feed-in tariff (FIT) programs has an interesting perspective which I'll return to. However, It's clear that wind and solar generation added around $2.7 billion to electricity costs in 2015, and the IESO's Ontario Planning Outlook, referenced in the government's press release on the suspension of procurement, shows that in real 2016 dollars cost for all generation rose $4.5 billion from 2006 to 2015 - so well over half could be attributed to due Smitherman's solid gold scapegoats. “If you’re concerned about cost, you do more renewables and less nuclear,” said Gideon Forman from the foundation, noting the suspension will cost jobs in the green energy sector. The Canadian Wind Energy Association warned cancelling the renewables will make it harder for Ontario to meet its greenhouse gas reduction targets in the battle against climate change. ...John Cook, president of Toronto-based clean-tech investment firm Greenchip Financial Corp., said many Canadian power producers have already shifted development plans from Ontario to provinces that are moving away from coal-fired electricity production, such as Alberta. Mr. Cook said it is important that Ontario residents realize green energy was responsible for only 5 per cent of the total increase in the price of electricity for the past five years. “The real cause of [higher] electricity prices has been nuclear refurbishment, transmission upgrades, the HST, and debt retirement,” he said. 5% is obviously not a figure that was fact checked by Blackwell or anybody else. However, on Twitter I did get a sense of where the ideas driving the nutty statements of the green crowd originate. While many people that read my blogs will be alienated by them, they deserve to be shown. I don't want to appear to agree with the argument Pickering should close, or to imply costs are significantly due to its continued operation. In 2015 Pickering produced far more power than wind and solar (and biomass) for far less cost (I estimate $1.3 billion less). Pickering's units also have a capacity value, or credit, far in excess of whatever it could be deemed wind has. The Province has also approved OPG's plan to pursue continued operation of the Pickering Generating Station beyond 2020 up to 2024, which would protect 4,500 jobs across the Durham region, avoid 8 million tonnes of greenhouse gas emissions, and save Ontario electricity consumers up to $600 million. The $600 million claim seems to originate in a November 2015 report by Strategic Policy Economics. Shutting Pickering does not appear to be an option unless new firm capacity is built - and even were Pickering not competitive on price, the government sabotaged the likelihood of building peaking natural gas plants as necessary when it caved to local concerns (during an election campaign) and moved planned relatively benign plants away from it's voting base in Toronto. It is likely the growth in renewables was intended to make nuclear's baseload supply appear impractical - but the gas plant scandal made eliminating nuclear an even less attractive choice. Wind, and now incremental solar, in Ontario should be seen as displacement sources of energy - they displace fuel from gas- and coal-fired generators, but not the generating units. Ontario now has very little fuel uses in the generation of electricity to displace. From this perspective, the government would be wise to not only cancel future procurement, but get out of previous contracts - particularly where a notice to proceed with construction is yet to be given. in 2011 a Liberal government sat on an IPSP and campaigned on their political Long Term Energy Plan (LTEP) as if it were professional planning. The 2013 LTEP can be viewed as an election platform, and preparing a 2017 LTEP puts it in the same cycle - coming for the 2018 election. Prior to last week's cancellation of future procurements, the government has already reset its agenda with a Throne Speech promising to move some costs of electricity from ratepayers to taxpayers (in removing the provincial portion of the HST). The Premier dutifully tried to sell that on talk radio shows, but being booed at a plowing match may have pushed her into this latest action - which I consider a political gamble as it threatens to upset an urban elite that has been the key element behind 13 years of Liberal rule. The government also appears to me to be getting some very unseemly support for holding rate increases down prior to 2018's election from OPG's bizarre rate increase application currently being evaluated at the Ontario Energy Board. OPG currently receives a $10.84/MWh rate rider for its nuclear output on top of a $59.29/MWh base rate - for a $70.13/MWh total. They propose to move that rate up $5.77/MWh (8%) for the 2018 election year, and then steeply increase it $24.01/MWh (34%) in the 3 years following 2018's election. 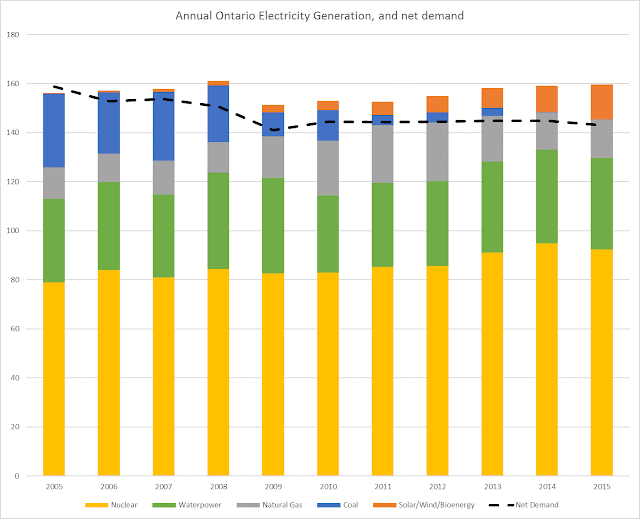 If the OEB allows OPG's illogical, politically pandering, rate application, the current government may recover from the anger at it over electricity cost increases by 2018 - and eliminating the poor optics of ordering more supply during that period will help too. Neither really does much about long-term price pressures though. OPG rate hikes will be planned, and the government has so far only suspended the procurments. Until the staff at the IESO that handle procurement are eliminated, this should be seen only as a temporary measure. Since that report the German Council of Economic Experts flagged the costs and the government pulled pack massively on contracting expensive feed-in tariff procurement.